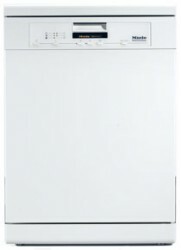 The Miele PG 8080 is a freestanding commercial freshwater dishwasher ideal for kitchens in office blocks, clubhouses and private households. The PG 8080 has a short programme cycle of only 18 minutes and can efficiently wash a large range of crockery, glasswear and cutlery. This machine is part of the ProfiLine range (PG 8080 U, PG 8081 i, PG 8082 SCI XXL, PG 8083 SCVi XXL) that includes models suitable for building-in and fully integrating into kitchen cupboards.